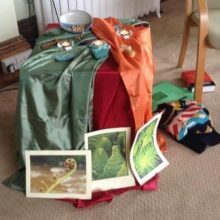 There were twenty-two people on the retreat this year (including quite a few who came for the first time) and Pam invited us to explore some of the many ways God sustains us as we journey closer to him. We traced labyrinths as we reflected on our journey so far; chose pictures and shared the ways in which they spoke to us about God; and thought about our relationship with him as we explored the symbolism of water. 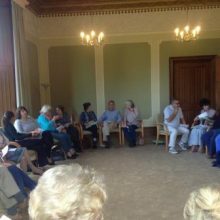 We came together for services in the chapel and spent times in silence, in our rooms, in the lovely Abbey House garden, or in the ruins of the Abbey itself. On Saturday afternoon, some of us climbed the Tor, to enjoy the stunning view from the top, and others walked round the town - which has two labyrinths of its own: one (for feet) in the grounds of St John's Church and the other (for fingers) in the Royal Magdalene Almshouses, which are hidden away down an alley in the centre of the town. As always, the staff at Abbey House took very good care of us and the food was delicious. Thank you to them, and to Pam for offering us so many ways to find bread for our journey.